AFSA President Ambassador Barbara Stephenson speaks about balancing international exchanges’ long-term goal of building mutual understanding with the short-term goal of supporting foreign policy priorities. From left: President and CEO of IREX Kristin Lord, Executive Director of The McCain Institute for International Leadership Kurt Volker, Stephenson and Brigadier General (ret.) and CEO of the American Security Project Steve Cheney. Global Ties U.S.—formerly known as the National Council on International Visitors, and a Department of State partner helping administer the International Visitor Leadership Program—held its annual national conference in Washington, D.C., on Jan 27-30. The event drew more than 1,000 leaders from across the United States who are on the forefront of connecting international visitors with their local communities. In appreciation of the December issue of The Foreign Service Journal, which focused on the 75th anniversary of the IVLP, Global Ties invited AFSA to represent the Foreign Service during the four-day event. Global Ties President Jennifer Clinton and Foreign Service Officer Robert Zimmerman (on detail to Global Ties) both wrote for the December issue and were instrumental in establishing the Global Ties connection with AFSA. Ambassador (ret.) 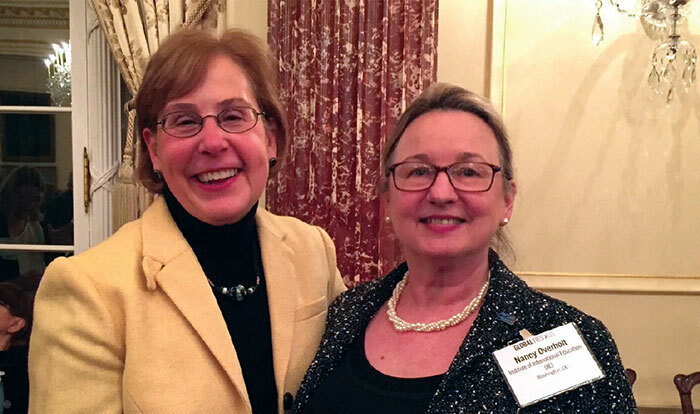 Linda Jewell (left) with Institute of International Education’s Executive Director of Professional Exchange and Community Outreach Nancy Overholt at the State Department-sponsored reception for the Global Ties Conference. 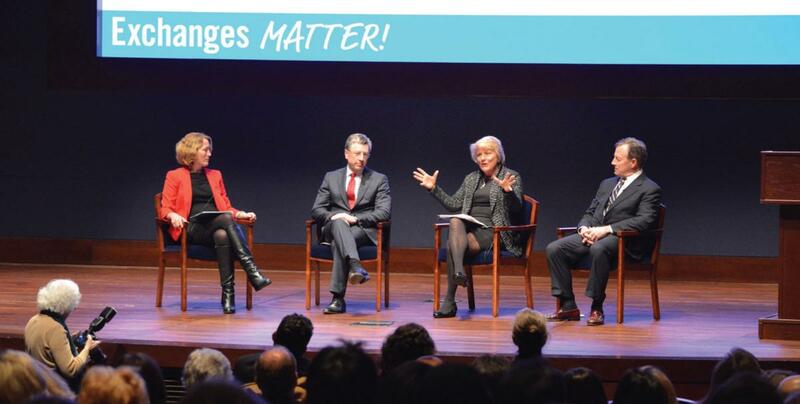 AFSA President Ambassador Barbara Stephenson kicked off the association’s participation by speaking during an afternoon plenary, “A Strategic Dialogue on Advancing Peace & Security through International Exchange Programs,” at the U.S. Capitol Visitor Center. The panel focused on the importance of international exchanges for advancing diplomacy and defense efforts. Sharing her experience as the consul general in Northern Ireland, Amb. Stephenson recalled when Consulate General Belfast used exchange programs to help the police force shift to a community policing model—a move that was critical for advancing the peace process. Working with the Bureau of Education and Cultural Affairs, AFSA arranged for Ambassador (ret.) Linda Jewell—an AFSA member and longtime supporter of the association’s Road Scholar program—to give the keynote address on the value of exchanges at an ECA-sponsored reception for conference participants in the State Department’s Benjamin Franklin diplomatic reception room with more than 300 attendees. Amb. Jewell drew on her 30-year career as a public diplomacy officer with the U.S. Information Agency and the Department of State and her activities in retirement. She has served as the vice president of International Student Exchange Programs and is currently the treasurer of the Public Diplomacy Council and a member of the board of Pyxera Global. 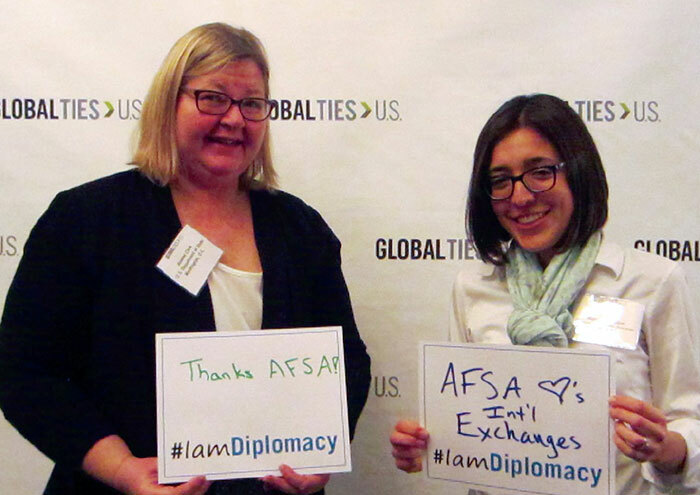 Jeanne Clark, a public diplomacy officer and AFSA member, dropped by the AFSA exhibit table to say thanks for her complimentary conference registration. From left: Clark and AFSA Director of Professional Policy Issues Maria Livingston. AFSA was pleased to offer every conference goer a free copy of the December FSJ and made numerous copies available throughout the venue for anyone who wished to take more to share with colleagues, friends and family. The association’s exhibit table was a popular stop in the conference Meeting Hub, where numerous visitors stopped to learn more about the Foreign Service. Several public diplomacy-coned Foreign Service volunteers—Robert Zimmerman, John Dunne, Kit Norland, Carlos Aranaga, Amy Bliss and Peter Kovach—helped staff AFSA’s table throughout the conference. Their personal perspectives were invaluable to visitors interested in how the Foreign Service helps advance American interests and values overseas. Conference goers were also eager to learn about the many ways AFSA can help enrich their programming for international visitors, as well as bolster their efforts to create a more globally aware citizenry in their home states. The association’s National High School Essay Contest and Speakers Bureau, and resources such as the popular book Inside a U.S. Embassy and The Foreign Service Journal, offer dynamic possibilities. Given the professional development and networking opportunities inherent in this type of event, AFSA raffled off two complimentary conference registrations to PD-coned members. Deputy Director Jeanne Clark of the Bureau of International Organization Affairs’ Office of Public Affairs, Planning and Coordination and Assistant Cultural Affairs Officer Amy Steinmann of Embassy Moscow were the lucky winners. AFSA wishes to thank everyone who had a hand in ensuring that AFSA’s presence at the Global Ties conference was strong. Thanks to this team effort, AFSA—and the Foreign Service—established a new and important relationship with one of the country’s largest networks of internationally minded civic leaders. We look forward to working with Global Ties U.S. and its affiliates in the near future. Maria C. Livingston is Director of Professional Policy Issues at AFSA.